For the diehard Granola addict ingredients come under two categories; ‘fixings’ which are the dry ingredients and ‘glue’ which are the wet ingredients. The fixings are a grain base, usually oat flakes and/or any combination of rolled grains, such as barley, wheat, kamut etc., embellished with seeds and nuts. The glue is a mixture of light oil or melted butter sweetened with honey or maple syrup. I have been using a virgin rapeseed oil called Mellow Yellow more recently but any light oil would do the job. I use my Tala Cooks measure to measure the ingredients. When I’ve got Granola in the cupboard I can’t wait to eat it each morning for breakfast with homemade natural yoghurt and another swirl of maple syrup, so it never gets the chance to go to waste but stored in an airtight jar it should keep fresh for a few weeks. Apparently it will freeze for ages but I don’t really see the point. If you consume it at a slower rate just make smaller batches. Makes approx 1.5kg / Fills 2 x 1 litre size jars plus a few more helpings. Pre heat the oven to 160C, 325F Mk3. Mix the ingredients in a baking bowl using your hands until all the grains and nuts are coated. Spread the mixture in shallow metal baking dishes and bake in the oven for 25-35 minutes, turning the mixture a few times within that time and watch that the nuts don’t burn. The mixture should be nicely toasted and slightly golden. Remove from the oven and leave to cool in the trays. The mixture will be soft when taken out of the oven but will crisp up as it cools. 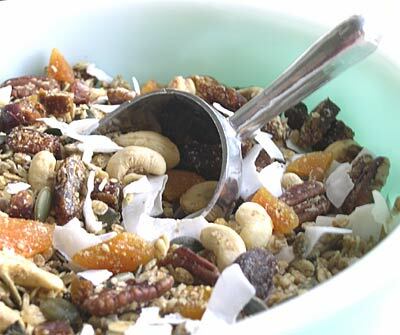 When cold add a handful each of roughly chopped dried apricots and dates and add some coconut chips if you wish. Chopped figs, prunes, dried blueberries, cranberries or goji berries also work well. Keep the pieces nice and chunky so they make a nice contrast with the grains. Mix them through the Granola, then shovel into airtight containers.